Designed for high altitude use on winter Bivouacs. 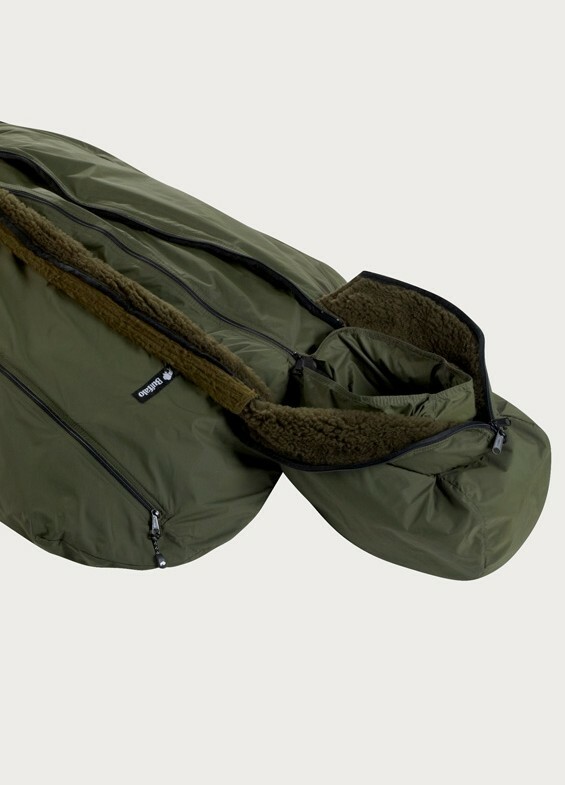 Where weight and bulk are paramount, Buffalo clothing is intended to be used instead of an inner bag. 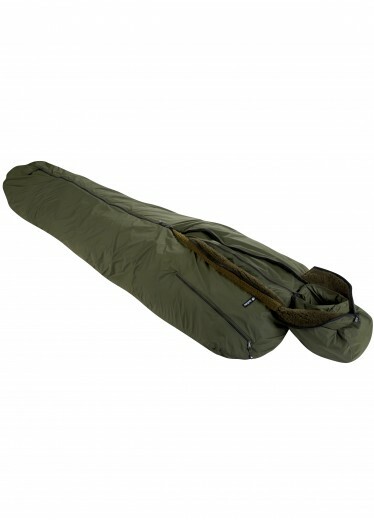 The detachable Thermaliner keeps body heat in and protects the pile from mud and dirt. It is advisable to use a bivvi-bag as well. Please note that this bag is not recommended for low level use, where it is cold and wet. The 4S system is recommended for such conditions. Heavy duty, full length, internally baffled front zip on Outer. Internally baffled shoulder zips on Outer. Zipped hood closure on Outer. Three internal elasticated volume adjusters on Outer. Full length front zip on Thermaliner. All zips are non-locking zips. Compression straps attached to stuff sack. got this superbag last year.i went camping wid it in january and it woz -7 no tent just the good old superbag.heavy but very well made and will last you years n year.THANKS BUFFALO.in buffalo i trust. When I first saw this bag my reaction was NO WAY I TAKE THIS ALONG; but being a good sport and having excellent experience with the Teclite and DP made me try it anyway. And YES, surprise! this is indeed a super bag. So much that since I have this bag my down and synthetic bags are staying on the shelf being very expensive. There is lot to say regarding weight but if I do the calculation, a pack with tent and down bag and clothes weighs the same or more compared to a full Buffalo bivy setup. Using your clothes as a part of your sleeping system might not sound comfortable but it actually is. It not only reduces overall weight, it is more practical in many situations. No need to get into cold, wet/frozen clothes in the morning. No need to be cold and uncomfortable any time any place any season. The ease of use and freedom the Superbag and Buffalo in general gives is unlimited within European standards. Not having to worry about dampness at any time or even light rain (without a bivy bag) is for me very comforting. When only slightly damp at the feet from using a bivy I stuff it as it is, finding it dry the same evening. Any way, damp or not it makes no difference. During my urban and off road long distance bike trips I don’t need to spend time and energy on finding a suitable tent place (it is far more simple to bivy along a bike path and being greeted by the locals in the morning). I simply do not take a tent any more. In this bag I can sleep where ever. All I take is a bivy bag, a mat and mini tarp for when it rains and cannot find some sort of shelter. I choose this bag over the 4S Outer bag for the arm zips and the longer double zippers which are very useful. Actually all the features on this bag make sense and are right where they should be. There is nothing too much nor too less on the bag. The hood is the cream feature having a double zip making it possible to make a very high collar leaving the eyes free or to leave a breathe hole covering full head and nose using your precious hot air. No worry to breath inside like you need to take care of when using a down bag. As I sleep in a Teclite shirt/pants combo or DP combo my arms out of the bag are warm enough. Like this I cook and even walk around camp using a bungee cord to tie the foot end around my back waist (and do the crocodile dance). So the bag is a camp jacket too. Sleeping in a full Buffalo kit does need getting used too. For instance I don’t like the touch of the DP pile on my skin during the night. During the day it’s very fine. So I always wear the Windshirt underneath which works perfectly (and when the shirt is damp it dries in 5 minutes). When around -10 degrees I wear the Teclite underneath the DP. That combination works fine but gets at times restrictive in the armpits. A good solution is the to zip open both suits to give some more space. I sleep cold so now I experiment for deep winter use with the addition of the Lightweight outer bag. The combination Teclite/DP/Lightweight outer/Superbag works fine when very cold but I prefer not to wear the Teclite (and use them as an extra pillow) and turn the DP Special 6 pants inside out for that soft feel (or wear Pertex pants underneath). So a first layer of Pertex Shirt/pants / DP suit / Lightweight outer / Superbag is for me the best and most comfortable cold weather combination. The down side of having many layers is the itch that needs a scratch. The good side is once the fumbling about is over and done your totally warm and very happy. So far I never had to go in with very wet gear but I trust it would not take long to heat up and feel cosy enough to sleep. The Superbag is a safe haven.